Today we will resume our discussion about the bashraf (pre-composed instrumental form with often quite long binary rhythmic cycles, played as a prelude to the waṣla. The structural pattern of the bashraf generally alternates four khāna-s and the taslīm/ritornello. 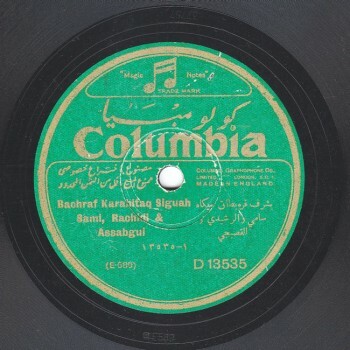 There are other types of semi-composed bashraf alternating one or two composed sections and an improvisation in a binary rhythm responsorial between the instrumentalists) qarah baṭāq sikāh by kimānist Khuḍr Āghā, arabised by an unknown 18th or 19th century musician who was seemingly very knowledgeable. Our previous episode ended with the first khāna (section) that kept its 32-beat’ measure. In the end, he added the following … (♩) two measures both to end the first khāna and to start off the taqsīm-s. We will see in our future episodes that in the early recordings of this bashraf, they made sure to perform 8 questions and 8 answers in order to keep the 32-beat’ measure. First, let us remember the bashraf. The more recordings we play, the better opportunity our listeners will have to compare. We listened to most early Arabic recordings except for Mr. Aḥmad al-Ḥifnāwī’s. Beautiful Sī Muḥammad Afandī al-Qaṣṣabgī! Beautiful Si ‘Alī Afandī al-Rashīdī who played one of the most beautiful taqsīm ‘ala l-waḥda ever performed in this bashraf. Where did he come up with such an imagination? Beautiful Sī Sāmī! Noticing that the record was reaching its end, he did not repeat the lāzima that, as we said earlier, was taken from the lāzima between the second khāna and the third khāna, and from the lāzima between the third khāna and the fourth khāna in the Turkish basharf. He went straight to the fourth khāna –that we will later discuss in detail– that was arabised into a 10/8 samā‘ī thaqīl. This recording was published within AMAR’s two CD set dedicated to Muḥammad Afandī al-Qaṣsabgī who did something beautiful: he went on performing masterful taqsīm ‘ala l-wahda on the ‘ūd up to the end of side 1. The first thing that will change is the aspect. We are used to the sikāh as a sikāh aspect with a sikāh aspect. Whereas, at a certain point in time, they turned it into a sikāh aspect with a rāst aspect, referred to as a sikāh ḥalabī (Aleppan sikāh) or sikāh sūrī (Syrian sikāh) by Mīkhā’īl Mashāqa. We are used to the sikāh in its original old form –with all due respect to the modernists– that is still used today in all popular, mundane, and classical traditions. People think that it is a minor sikāh aspect and a ḥijāz aspect, whereas it is in fact a sikāh aspect with a sikāh aspect. Those who would like to know more about this may consult the “Niẓāmunā al-Mūsīqī” show episode dedicated to the sikāh published around 2 years ago. The only difference until now is in the aspect, as we have already mentioned. This was the bow’s section. They try to stay away from long notes and sequences as much as possible. So this is how the first khāna was arabised. I still can’t understand why he took part of the dialogue and made the band play it… maybe because he annulled, from the start, the concept of a written dialogue and placing taqsīm-s. But let us stop now and continue the analysis of the remaining khāna-s and taqsīm-s in our future episodes. 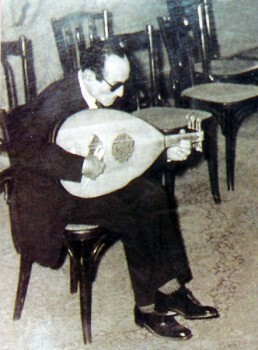 Let us now listen to the second recording published by AMAR one year before the publication of Sāmī al-Shawwā’s CD set. 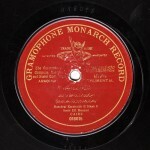 It was recorded by Gramophone on a 25cm record, like the Columbia record. The two records only have Sāmī al-Shawwā in common, and this one also includes Muhammad Afandī al-‘Aqqād (qānun) and Ibrāhīm Afandī al-Qabbānī (‘ūd). 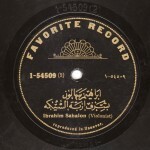 The recording was made late in 1918 or early in 1919. We will meet again in a new episode to resume our discussion about kimānist Khuḍr Āghā’s bashraf qarah baṭāq sikāh.